Batik is a cloth that traditionally uses a manual wax-resist dyeing technique. Javanese traditional batik, especially from Yogyakarta and Surakarta, has notable meanings rooted to the Javanese conceptualization of the universe. Traditional colours include indigo, dark brown, and white, which represent the three major Hindu Gods (Brahmā, Visnu, and Śiva). This is related to the fact that natural dyes are most commonly available in indigo and brown. Certain patterns can only be worn by nobility; traditionally, wider stripes or wavy lines of greater width indicated higher rank. Consequently, during Javanese ceremonies, one could determine the royal lineage of a person by the cloth he or she was wearing. Other regions of Indonesia have their own unique patterns that normally take themes from everyday lives, incorporating patterns such as flowers, nature, animals, folklore or people. The colours of pesisir batik, from the coastal cities of northern Java, is especially vibrant, and it absorbs influence from the Javanese, Arab, Chinese and Dutch cultures. In the colonial times pesisir batik was a favourite of the derivative Chinese, Dutch and Eurasians. 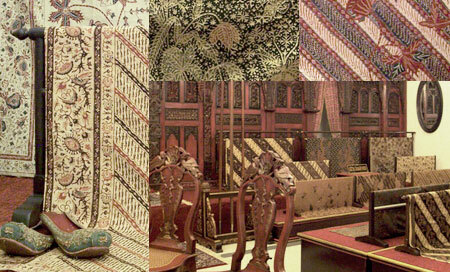 UNESCO designated Indonesian batik as a Masterpiece of Oral and Intangible Heritage of Humanity on October 2, 2009. As part of the acknowledgment, UNESCO insisted that Indonesia preserve their heritage. 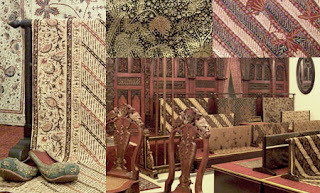 Batik or fabrics with the traditional batik patterns are also found in several countries such as Malaysia, Japan, China, Azerbaijan, India, Sri Lanka, Egypt, Nigeria, Senegal, and Singapore. Malaysian batik often displays plants and flowers to avoid the interpretation of human and animal images as idolatry, in accordance with local Islamic doctrine.